Forget the picture to the right! Though places like this do in fact exist here in Arizona, they are over a one hour drive from where I live in north Scottsdale. My Obsession telescope is used entirely from my back yard where the limiting naked-eye magnitude is never better than 5.2. On the best nights (and always after midnight) I might catch a glimpse of the Milky Way in Cygnus and Aquila. I have heard and read that big "fast" telescopes don't perform well under urban conditions. This has simply not been my experience! Before my "observatory" was completed, I used my brand new 18" f/4.5 (#268) from my driveway near the front of the house, a mere 50 feet from a sodium vapor street light. Even under these horrible conditions, the scope performed almost as well as past experiences with a 12.5 inch under skies resembling this picture! And in the backyard away from that light it performs even better! One of the big selling features of the Obsession line is its "supposed" portability because of the ease of assembly. But don't ask me! I have assembled the scope exactly twice! My 18" remains fully assembled-- complete with wheelbarrow handles attached for setup times under 2 minutes. Because of the short distance I travel to my observing site (approximately 65 feet) and the ease of setup, I take my scope out often. In the first 8 months the scope was taken out over 300 times on 180 nights. Were some of these nights less than ideal? Absolutely. So what if the conditions don't improve? In 2 more minutes, I'll be back in the house. I am primarily a variable star observer, and do deep space observing only when I have a little extra time. 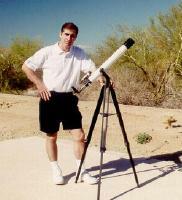 I specifically wanted a larger telescope to do ever fainter stars. Variable star observing differs from deep space observing in many respects, the most important of which is the factor of time. Don't observe M13 tonight and no problem. It will still be visible tomorrow, and possibly a lot better. Miss a variable star estimate, and you've possibly missed it forever (these objects wait for no one). Another critical difference is I am only looking at stars. This means light pollution effects are much less than they are for deep space because you have an important weapon at your disposal: high power. Increased magnification decreases the sky background which translates into fainter star visibility. With my 18 inch I usually work at 300X, even though the seeing conditions are not necessarily all that good. Even though the star images may be a bit blurry, it's only important that you can see them! When seeing is above average, I will work at 428X. I use Nagler-type eyepieces which seem to perform extremely well with short focal length telescopes which is exactly what Dave Kriege of Obsession recommends. These differences make all the difference. If I look outside and it's clear, the telescope comes out on a moments notice. Seldom do I have the luxury of waiting for the scope to reach ambient temperature. 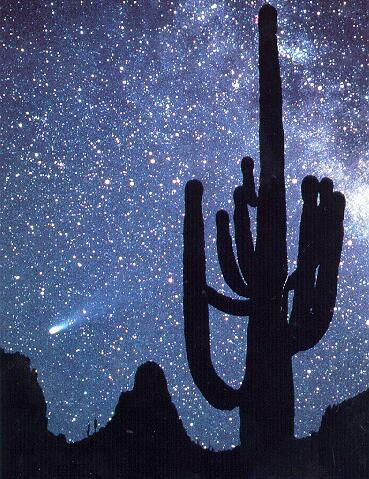 Stars that are low in the west will become unobservable if I wait. Therefore, I'm hit twice. The scope hasn't cooled and I'm looking through a lot of atmosphere. But with this scope I have little difficulty reaching magnitude 15.5 and have reached as faint as 16.5 on many occasions. I figure it this way: I can reach 15.5 with a 12 inch under gorgeous skies (like the picture) after an hour and a half drive, or I can use the 18 inch from home. No one is going to argue that it isn't more fun to be under those extremely dark skies, but from a productivity standpoint the backyard is going to win every time. This scope is in fact exceeding my wildest expectations, but let me be frank: my expectations for this scope were very low. Sure I'd looked through large telescopes here and there, but never had a lot of first hand experience. I had heard horror stories about one hour cool down times and usefulness only when the seeing conditions were well above average. My experience has lead me to a simple conclusion: if you're going after faint stars and nebulas, the big telescope beats a smaller telescope almost every time. 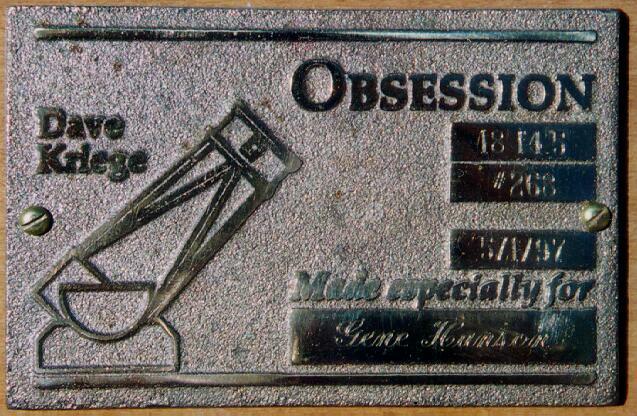 A big selling feature of the entire Obsession line is the smoothness of operation. This is the one feature I was really counting on. Mine has performed as advertised. Even at 428X hand-guiding is no problem because there is almost no backlash. This has proven a huge benefit because most of the time I'm going after stars near the limit of detectability if not downright invisible. The ease of movement also has virtually eliminated the problems I used to have with the so-called "Dobson's Hole." The proof is ultimately in the results. 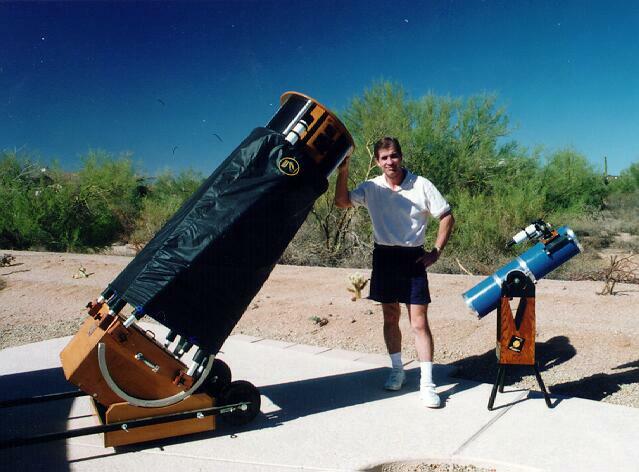 I've been a variable star observer for 20 years and have logged just over 50,000 estimates. Over half of those have been made with my Obsession in only three years! Before utilizing this scope, I had accepted the axiom that observing productivity would be decreased because handling a large telescope is bound to be more time-consuming. My previous scopes could be operated with my feet on terra firma. However, mine is the 18 inch f/4.5 so I only need a small step-stool, so that didn't cost a lot of productivity. The gains have come from three areas. 1) The larger aperture now allows me to go after much fainter objects which has extended my observing program. 2) The smoothness of operation means I no longer fight to make those extremely faint star estimates. And 3) Viewing with a large telescope simply makes it more fun! For anyone whose mind is made up about owning a large Dobsonian, I have no difficulty recommending Obsession. Since getting this telescope, I have finally had a chance to use Starsplitter and Skydesigns 17.5 inch models. Though my observing time with these scopes was been extremely limited I have come to the conclusion that I would have probably been just as euphoric with those scopes coming off of an inferior 12.5. (Sorry, I have not had the pleasure of looking through a Starmaster as of yet.) Those that I've heard that are somewhat dissatisfied with these large scopes (not just Obsession) are those that have to cope with the assembly and disassembly. Remember: I don't have to deal with this! Though I do plan to start CCD observing sometime in the future, I am also thinking of going to a 25 inch. If I do, I will not think twice about ordering another Obsession. More about my observing site with pictures. Though I've been very happy with my 18 inch f/4.5, on a recent visit to my local department store I bought a new 600X telescope that I'm pretty excited over. (Check out the cool picture of me and the new scope at the right.) It seems to be superior to the Obsession in a number of areas. 1) It is a lot cheaper. Forget paying thousands of dollars, I paid about one hundred! 2) Immediate delivery. You don't have to wait for months on end anxiously waiting for Dave Kriege to finish your scope! They had several of them just sitting there in boxes all ready to go. Apparently, I'm one of the few who've spotted this great deal. I expect a run on these when the news gets out. 3) Easy transportation. Who needs stinking wheelbarrow handles? You don't have to worry about breaking down this scope, either. Just throw it in the car! 5) .965 in. eyepieces! Forget those heavy 2 inch Naglers and balancing problems they can create. 5) No pesky alignment problems. No cheshire, no laser, this one comes aligned straight out of the box! 6) 600X! This beats my Obsession where the largest power I have available is 428X. And as I like to say, the proof is in the viewing. Here are some drawings I've obtained.